Orson Welles on the job. Photo courtesy of Photofest, Inc.
It’s almost “Mischief Night” and, back in the day, if you ever enjoyed plotting a few sly schemes with a bar of soap, a roll of toilet paper and random doorbell ringing as a kid, you know what that means. Good clean fun! Seventy-five years ago, when my parents were young adults, October 30, 1938 kicked in like any other Mischief Night. But by 8:00 p.m. that Sunday evening, innocent pre-Halloween pranks took a backseat to the horror story unfolding on CBS Radio. With no TV, Internet or smart phones in sight, young and old gathered around their radios, as usual, awaiting their favorite Sunday night programs, much as my generation did decades later with The Ed Sullivan Show at 8:00 p.m. on Sunday nights on CBS TV. In 1938, radios were America’s lifeline, a rich source of news and entertainment. While riveting theatrical dramas and groundbreaking comedy hours were immensely popular escapist fare, distressing breaking news reports were also a sign of the times. The continuing economic free fall of the Great Depression, horrifying New Jersey-based tragedies like the Lindbergh kidnapping and Hindenburg firestorm, and international reports of Hitler’s growing menace in Europe all rattled Americans’ sense of stability. On October 30, those who tuned in to the latest production of Mercury Theater on the Air on CBS Radio not only witnessed the creative explosion of 23-year-old theatrical writer/director/producer/actor Orson Welles‘ talents, but also an explosion of a much more frightening kind, one that would rattle the country’s nerves, already shredded by fear of the unknown. If listeners tuned in to Mercury Theater on the Air at the show’s start time, 8:00 p.m., they learned that the Mercury players would be dramatizing H.G. Wells’ classic alien invasion novel, The War of the Worlds. Such fun! Sheer entertainment! However, the million-plus listeners who came late to the show (whether they were out on the town egging their neighbors’ houses or at home initially enjoying Sunday night radio favorites Edgar Bergen and Charlie McCarthy on rival network NBC) heard, instead, what sounded to them like breaking news reports about a Martian landing in Grover’s Mill, NJ. Pandemonium ensued in New Jersey and spread swiftly throughout the country; panicked Americans packed their belongings and ran en masse into the streets, hid in the hills, rang church bells and proclaimed the end of the world; tragedy followed. What turned out to be a Mischief Night prank to end all pranks catapulted the broadcast and the mass hysteria that it incited onto the front pages of every major newspaper worldwide and kicked Welles’ career into the stratosphere…after he had a lot of explaining to do at a follow-up press conference. 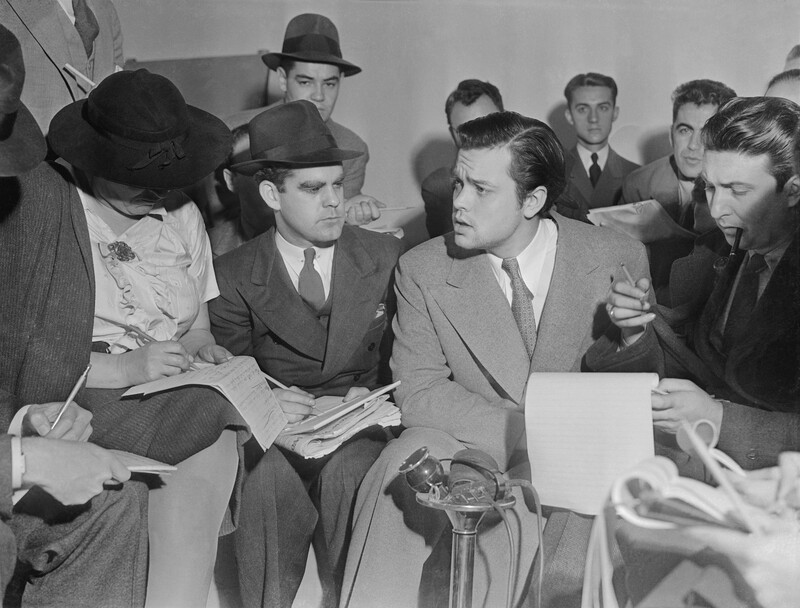 Welles cleverly fine-tuned his acting skills during an apologetic follow-up press conference. Photo courtesy of Corbis. Tonight on PBS (Tuesday, October 29 @ 9:00 p.m. ET, check local listings), American Experience celebrates the 75th anniversary of this groundbreaking radio broadcast, the creative talent behind it, the public’s response to the show, for better or worse, and its evergreen implications with the debut of Cathleen O’Connell‘s crisply directed documentary, War of the Worlds. The hour-long documentary is an enjoyable ride through the back story of the broadcast and provides new insight into Welles’ maverick spirit. 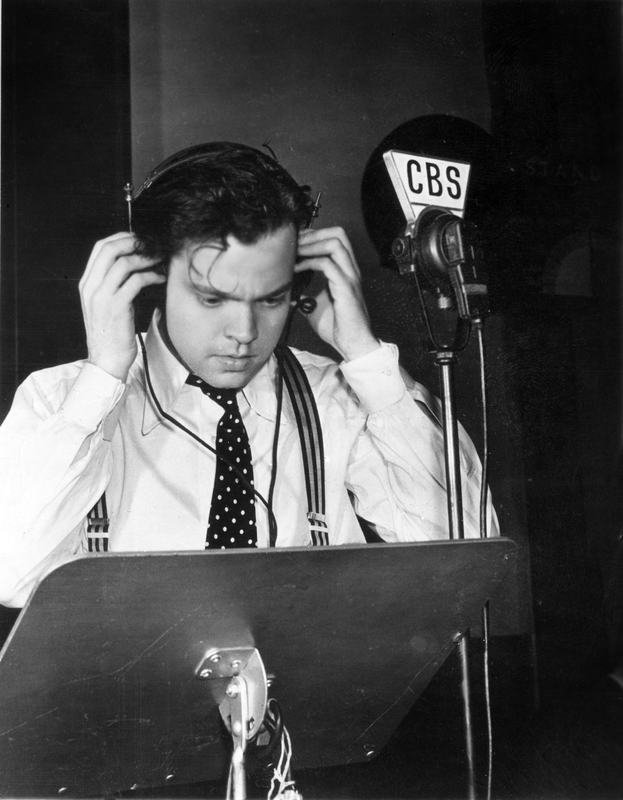 In retrospect, War of the Worlds was pure genius, a phenomenal use of the radio medium at its very best. Welles’ daughter, Chris Welles Feder, is here to tell you how and why, as are a smattering of period historians and film pros like Peter Bogdanovich who clearly set the broadcast and its implications into its proper time and place. The broadcast, not surprisingly, provoked many Americans to write emotionally charged letters about the evening as it played out. O’Connell incorporates the letters via vintage “interviews” with some of the more colorful letter writers. These re-enacted segments are, at times, comical; but they more often than not also seem stilted and just too consciously “faux” to be believable. However, O’Connell’s use of wonderful audio clips from the broadcast, as well as fascinating period footage, news clips and stills will keep you glued to your seat throughout this otherwise briskly paced documentary. Note: After its initial broadcast, American Experience: War of the Worlds will be available on DVD, via iTunes or watch at www.pbs.org/wgbh/americanexperience/films/worlds/ —J.T. This entry was posted in Film, Radio, TV and tagged American Experience, Broadcast History, Cathleen O'Connell, H.G. Wells, Martian Invasions, Mercury Theater on the Air, Mischief Night, Orson Welles, Radio, The War of the Worlds. Bookmark the permalink. Great article Judy. Am interesting glimpse into the past.